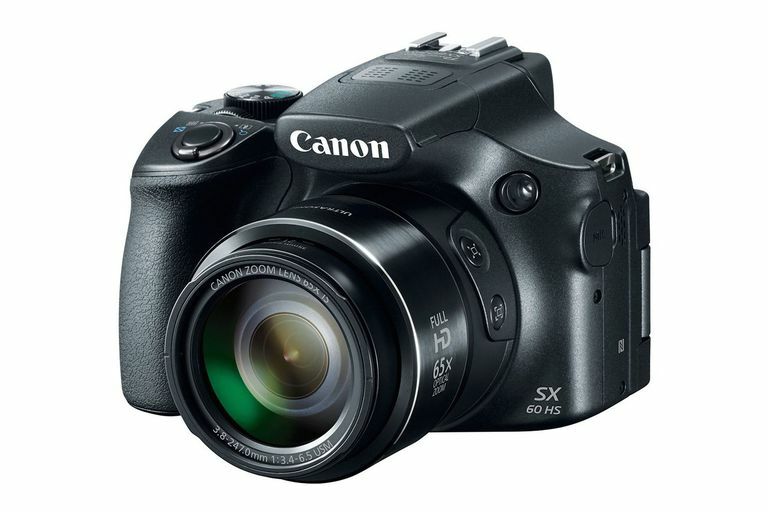 A 65x optical zoom lens is a rare commodity in a fixed lens camera, so the Canon PowerShot SX60 HS already exists in rarified air. But when you also consider that the PowerShot SX60 records images at a better quality and performs faster than other ultra-zoom models that can't match this model's zoom measurement, it's especially impressive. Canon has created a top-end ultra-zoom camera with the SX60 HS, offering strong image quality and performance speeds versus other large zoom models. You'll rarely experience problems with shutter lag or with a slow start-up. The biggest drawback to the SX60 is its large starting price and its large size. You will be paying a price for the Canon PowerShot SX60 HS that's similar to what you might pay for a slightly older generation, entry-level DSLR camera starter kit, and this model is similar in size and weight to a DSLR. Just don't expect anywhere near DSLR performance or image quality with the SX60 ultrazoom. To be fair, Canon gave the PowerShot SX60 plenty of great features that you may not find on an entry-level DSLR, which helps to justify the high starting price point. You'll have access to a sharp electronic viewfinder, a bright and sharp articulated LCD, and built-in Wi-Fi and NFC wireless connectivity. If you can fit the SX60 into your camera budget, you'll be very pleased with this ​impressive ultra-zoom camera! The SX60's image quality sends a bit of a mixed message, but the camera produces good images overall. The downside to this model's image quality relates to its small 1/2.3-inch image sensor, which is identically sized to the least expensive point and shoot camera. Consequently, the PowerShot SX60's image quality is not going to match up with other cameras in its price range, which can include some older entry-level DSLRs. However, when compared to other ultra-zoom cameras and other cameras containing small image sensors, the SX60's image quality is above average. This model's image quality is not always good when shooting in odd lighting conditions, which is a common problem with cameras with small image sensors. Both RAW and JPEG recording are available, and the PowerShot SX60 creates better image quality when shooting in low light if you're using RAW, rather than JPEG. We were pleasantly surprised with the performance levels of the PowerShot SX60 HS. Most ultra-zoom cameras are slow performers, leading to significant problems with shutter lag, but the SX60 outperforms most of is brethren. It's not going to give you a performance level that approximates other cameras in this price point, but it's an acceptable trade-off for the large zoom lens. Canon gave the SX60 a really good image stabilization system, which is very beneficial in a camera that has a large zoom lens. You'll be able to hand-hold the camera a bit more often than you might think versus other ultra-zoom cameras, but I'd still recommend having a tripod on hand. While the 65x optical zoom lens is the highlight of the Canon PowerShot SX60 HS, the manufacturer didn't ignore other aspects of the camera's design. Fixed-lens cameras with viewfinders are pretty rare to find in today's camera market, but Canon added a viewfinder to the SX60, further giving it the appearance of a DSLR. Both the articulated LCD and the electronic viewfinder are sharp displays. You'll also find built-in Wi-Fi and NFC connectivity with the PowerShot SX60 HS. While both features will drain the battery quickly when you use them, certain photographers will appreciate the ability to share photos immediately after recording them. Ultimately, the SX60 is a chunky camera, so it may not appeal to everyone. It approximates the size of a DSLR camera without the extra flash units and interchangeable lenses that are part of owning a DSLR of course. Our biggest complaint about the PowerShot SX60 is the size and placement of the four-way button, which is too tightly set to the camera and too small to be used comfortably. While ultra-zoom cameras typically look like great cameras at first glance but end up being disappointments when you begin using them, the SX60 doesn't follow that pattern. Canon has created one of the best ultra-zoom fixed-lens cameras, even with its high starting price.